Like half the internet I'm working on duplicating a setup from one Amazon EC2 availability zone to another. I couldn't find a quick way to do that if my stuff wasn't already described in Cloud Formation templates, so I put together a script that queries the security groups using ec2-describe-group and produces a shell script that re-creates them in a different region. With non-demo security group data I ran into some group-to-group access grants whose purpose wasn't immediately obvious, so I put together a second script using graphviz to show the ALLOWs. A directed edge can be read as "can access". 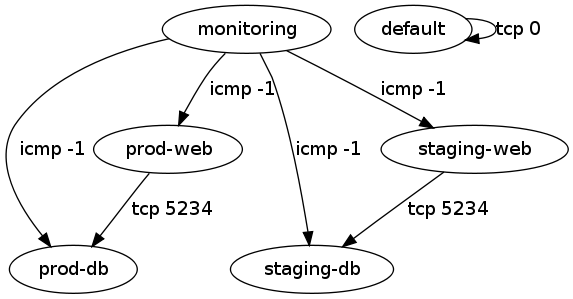 The labels on the edges can be made more detailed, but having each of tcp, udp, and icmp shown started to get excessive. Both scripts and sample input and output are in the provided tarball.